An early fill-up at the Tugela Truck Inn before the midnight fuel hike deadline saved this operator R730.44. On the stroke of midnight on October 3rd, the trucking industry was hit with a R1.24 per litre price hike on diesel while motorists had to cough up an extra R1.00 per litre on petrol. While most commentators focussed their attention on the impact the hike would have on ‘hard pressed’ motorists, little comment was made on how this would impact on truckers. Given the already high cost climate that truckers are operating in, the impact is huge. It’s a killer writes Patrick O’Leary. To give an idea of the cost impact, I delayed a trip back from Ladysmith on the afternoon of October 2nd to pop into the Tugela Truck Stop and – later in the evening – the Highway Junction truck stop in Harrismith to get a hands-on feel for the reality of the diesel price increase and to chat to a number of drivers who were filling up before the midnight deadline. The 589 litres of diesel cost R9 000 before the hike of R1.24 per litre. The increase would have brought it to R9 730.44 – an extra R730.44. This is an added cost which no transporter can afford to carry. It has to be passed on. At Tugela, it was latish afternoon when I arrived and the place was pretty empty. The trucks would start arriving later. The average number of trucks that park there during the night is around 250. The one truck that was parked at the pumps was filling up and ended with 589 litres (50ppm low sulphur diesel) at a pump price of R15.28 per litre. The total came to R9 000. Now add the R1.24 per litre increase which was due to kick in at midnight and the same 589 litres would have added another R730.44 to the bill bringing the total cost to R9 730.44. This truck was carrying yellow maize to Durban harbour for export so the extra R730.44 represents another nail driven into the coffin of our global competitiveness considering that the cost of logistics as a percentage of GDP in South Africa is already almost double that of the United States and 50% more than Japan and Brazil. Sakkie Cornelissen, manager of the Tugela Truck Inn for over 20 years, and his wife Ansie, are a delightful couple who can tell many stories around the trucking industry. They have a particular affinity for truck drivers. Sakkie ensured all went smoothly at the pumps on the night of October 2nd – as he does every night. After spending some time with Sakkie Cornelissen, manager of Tugela Truck Inn and his lovely wife chatting about the old army days and things trucking, I then drove on to Harrismith to visit the Highway Junction truck stop. 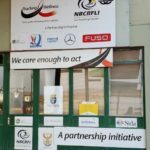 As an aside, before leaving, I popped into the Trucking Wellness centre situated on the site for a quick chat with the sister on duty, Nokuthula Kubheka. 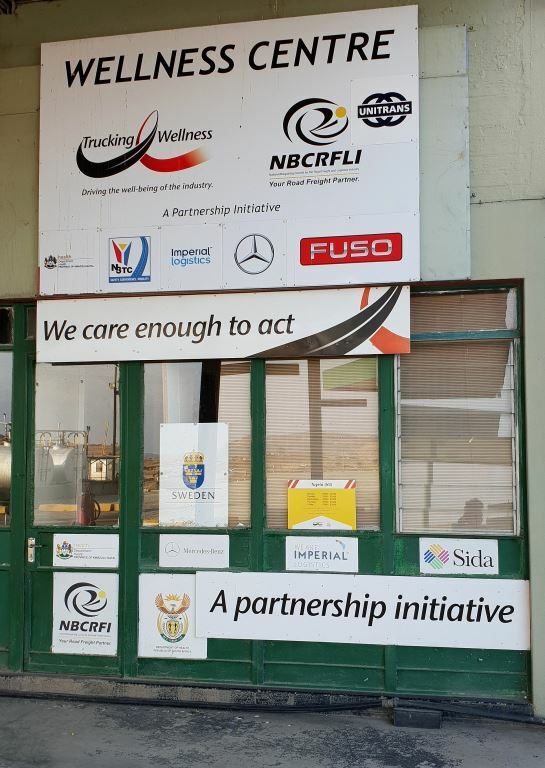 While waiting for her to finish with a patient, I looked around at the various posters displayed and was once again struck by the fantastic service these centres provide to the truck drivers of South Africa. Having started off in the mid 1990s as Trucking Against Aids in response to the HIV/AIDS crisis that had hit the industry, they have broadened their offerings under the Trucking Wellness banner to the point where truck drivers can now visit for any ailment. They are, in every way, the truck driver’s friend and should continue to get the industry’s full support. When I eventually met with Sister Kubheka, she was everything a worried truck driver would want in a nursing sister. Her lovely smile and friendly manner makes you immediately warm towards her. 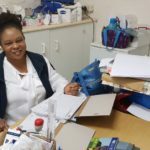 The good news is that on the issue of HIV/AIDS, she said the truck drivers had come miles in their awareness of the illness and, importantly, on preventative measures. It’s a win. Salute to this organisation. Now back to the fuel hikes…. 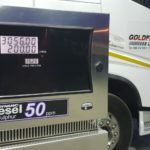 There was a busy night ahead for pump jockey Mhlengi Zikalala as trucks pulled into the Tugela Truck Inn to save bucks on their fuel fills before the midnight price hike of an extra R1.24 per litre kicked in. By the time I left, it was dark and the trucks were steadily coming into the Tugela Truck Inn. It was going to be a busy few hours for pump jockey Mhlengi Zikalala as trucks started to line up at the pumps. This picture doesn’t really do justice to the number of trucks that were waiting at the pumps at Highway Junction on the evening of October 2nd to fill up to beat the midnight price hike. Many thousands of Rands were saved across the board by those trucks which did manage to fill before 12h00. A professional truck driver for over 22 years, Peter Theron who drives for L.M. Botha Vervoer, beat the midnight deadline at Highway Junction but is not happy about the increase saying it will cost the company’s 5-truck fleet an extra R60 000 per month in fuel. One truck driver I spoke to, Peter Theron from L.M. 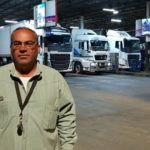 Botha Vervoer – a professional truck driver for over 22 years who was driving a Mercedes-Benz Actros 2646 curtainsider link – said the increase would add R60 000 per month to the fuel bill of the company’s five truck fleet. Now check this out. When he left Durban, he put in 615 litres at R13.96 per litre giving a total of R8 582. At Highway Junction, he topped up with 243 litres at R14.38 per litre to get him to Cape Town. This came to R3 493.20. The pump price was R14.78. When he would have reached Cape Town the following morning, he would again fill up with 850 litres for the trip back. He looked up in his book for the price per litre the last time he filled up in Cape Town. It was R14.00. By the time he reached Cape Town, the R1.24 cents per litre hike would have kicked in so he would be paying R15.24 cents per litre for that 850 litres totalling R12 954. Before the increase, he would have paid R11 900 – so that’s an extra R1 054. In short, for the three fills – in Durban, Harrismith and Cape Town – the old price was R23 975. Add the R1.24 cents per litre increase and that shoots up to R26 094 – an extra R2 119 for the same amount of litres. So, from one minute to midnight on October 2nd to one minute after midnight on October 3rd, over two-grand was added to the fuel bill of just this one truck – and there was nothing, nada, not a thing, the operator could do to prevent this huge cost increase. Readers will notice the difference between the pump prices at various filling points – and the fact that some operators even pay less than the pump price. Remember that the designated diesel price as stipulated by the Department of Energy is on the wholesale price of diesel whereas petrol is on the retail price at the pumps. There are also zone differentials so different outlets for diesel will therefore charge different prices depending on a number of factors – a main one, of course, being transport. An outlet doing huge litres could also well run its own transport from the refinery to the service station and thereby save costs on outside transport. As for the lower cost to some operators between the pump price displayed and what they actually pay – this comes about through membership of various schemes such as Truck FuelNet, which offer its members discounts on diesel at selected outlets, along with other benefits. That aside, the above two examples serve to adequately illustrate the reality of the diesel price hike on the trucking industry. Now multiply that by the hundreds of thousands of trucks that ply our roads every day and one can begin to get an idea of the enormity of this fuel price hike on the trucking industry and, in turn, on the economy. 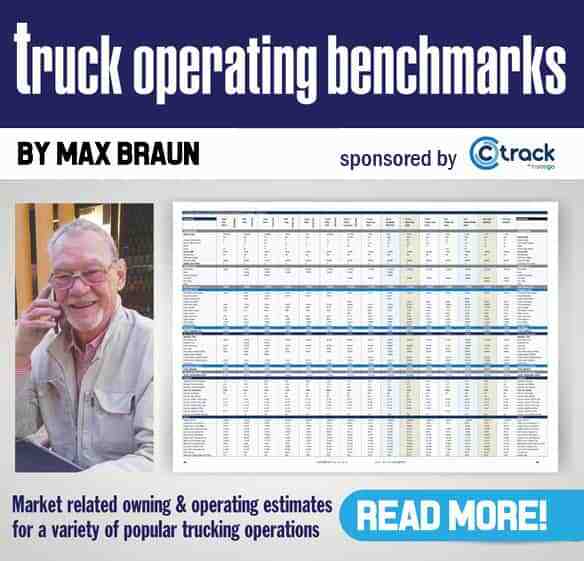 It’s a killer and as mentioned, I’ve yet to see any ‘high profile’ commentator mentioning the impact these hikes are having on the trucking sector. All focus seems to fall on the hard-pressed consumer. Well, that hard-pressed consumer is going to become even more ‘pressed’ when the impact of these fuel hikes on trucking filters through to the shelves of supermarkets and shops all over the country. No trucker can afford to absorb these increases. They have to be passed on but herein lies a huge problem for some operators – mainly the smaller ones whose customers refuse to accept any increases. Such operators have no option but to absorb the increase or lose the business of customers who don’t give two hoots about the trials and tribulations of their transporters. They just want the cheapest rate or they find another haulier. And with the competitive nature of the industry, it is easy to do so. The problem here is that they won’t be getting quality transport. Cuts will be made by those trying to survive – maintenance will be skipped and, if and when done, low cost ‘pirate’ parts will be fitted. 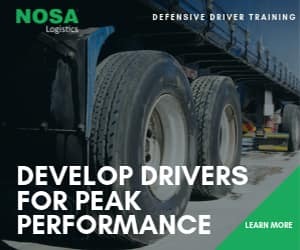 Training budgets – if in place – will be cut and drivers will be pushed and pushed until fatigue causes them to fall asleep behind the wheel and crash the rig. We are already seeing this and we predict it’s going to get worse. And here’s the really bad news: According to Max Braun. FleetWatch’s specialist fuel correspondent, speculation is rife that the oil price will rise to between US$90 and US$100 before the end of 2018. If the Rand remains weak in terms of the US dollar, the two combined – a higher oil price and weaker Rand – will shoot the fuel price up even further. And if the Rand remains weak against the Euro, we can also expect increases in equipment, replacement parts and tyre prices. It’s not a pretty scenario. In such a climate, I must mention that receivers of goods now need to catch a big wake-up for many give no consideration as to how long they keep trucks waiting before offloading them. I am currently working on a story where trucks are kept waiting for up to four days to offload at a major warehouse in Gauteng. This is downright crazy given that the standing costs for a 7-axle tautliner interlink works out at around R5 000 per day – depending on a number of factors. For some operators it is more, for others a little less. However, taking a figure of R5 000 standing costs per day, by keeping trucks waiting for four days, this adds R20 000 to the operator’s costs which he can never recover. It comes directly off his bottom line. The words of one driver summed the situation up perfectly. “It’s mal.” I would go a step further and attribute the movie title ‘The Perfect Storm’ to the environment in which the trucking industry is operating in today. 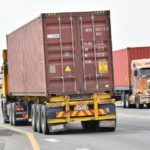 On saying this, and moving away from the fuel price hikes, I call it the ‘Perfect Storm’ for there is another huge wave that could well sweep over the industry in the next week or so – depending on when the Department of Transport makes its decision on the High Cube container issue. 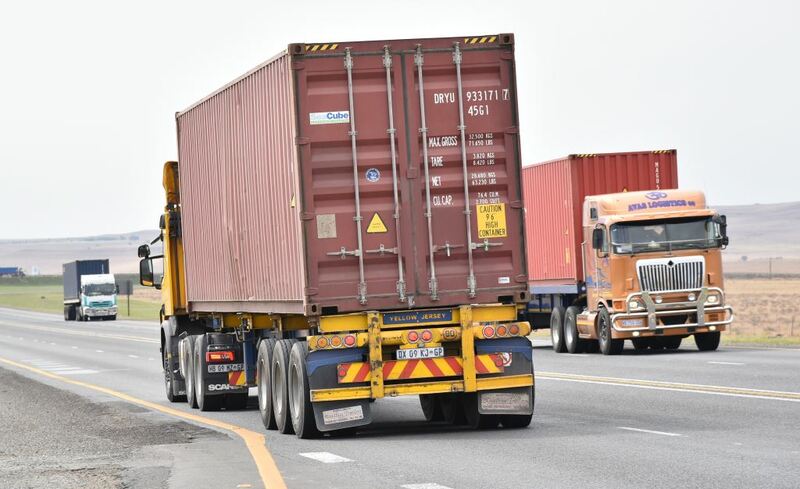 Without going into full details here – see Editors Comment https://fleetwatch.co.za/time-running-out-to-resolve-high-cube-container-issue/ – if the DoT maintains the height legislation at 4,3 metres when hauling High cube containers (which puts the height at 4.6m), the thousands of High Cube containers that come in and out of the country will be left high and dry as any transporter using his current equipment (trailers etc) will be illegal and will not transport them. The alternative – which is the route that up to now has been favoured by Government – is for equipment modifications to be made or brand new equipment to be bought. This is totally unaffordable to an industry already hard-pressed by the highest costs ever faced in its history. It truly is ‘The Perfect Strom’. GoldFields Logistics put in 200 litres at R15.28 a litre bringing the total to R3 056.00. After the hike, the litre price would have gone up to R16.52 bringing the total to R3 304. 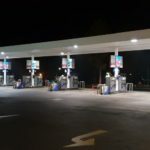 It was a hectic night for the manager of Highway Junction, Chris van der Merwe, who confirmed that there was a big rush to fill up before the midnight price hike kicked in. I found it amazing that while most commentators condemned the fuel price hike as having a dire effect on motorists, there was not one car filling up at the Engen Bergview garage in Harrismith – except for me. The time was around 11.00pm and I had just left a hectic Highway Junction where trucks were queuing at the pumps to avoid the increase. Truckers are carrying a heavy burden from this latest increase. 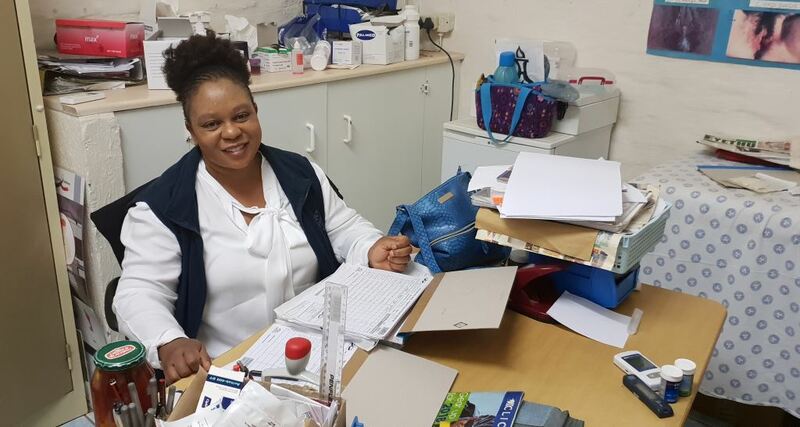 While the trucks at Tugela Truck Inn were busy filling with diesel to avoid the midnight price hike, the lovely Sister Nokuthula Kubheka was in the Trucking Wellness clinic to care for the truck drivers who needed help. No matter what goes on outside, these clinics are always there to lend a helping hand. Salute to Trucking Wellness. The Trucking Wellness clinic at Tugela Truck Inn. Apart from the fuel price hikes, the issue of High-Cube containers is the next big one facing the trucking industry. If the Department of Transport insists on maintaining the legal height at 4,3 metres, this is not only going to cost the industry dearly – in fact, adapting existing equipment or buying new equipment is out of the reach of transporters – but it is going to cost the economy dearly. It will make the fuel price hike look like walk in the park. The industry is eagerly awaiting a decision by the DoT. Let’s hope they make the right one.